Happy Valentine’s Day & a very special wish to recent passengers of Specialized Travel Services’ Nadia Bjorlin (DAYS OF OUR LIVES star Chloe Lane) & her fiancé Grant Turnbull, who got engaged last August amid the spectacular surroundings of the Giants Causeway. 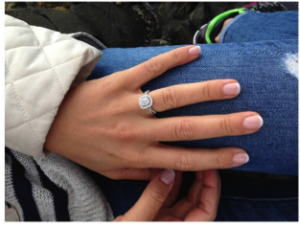 Nadia Bjorlin (DAYS OF OUR LIVES star Chloe Lane) accepts a ring from Grant Turnbull when he proposes amid the spectacular surroundings of the Giants Causeway. Turnbull “What an incredible trip we experienced, there were parts of the North I hadn’t experienced and I grew up there, Bushmills was definitely our highlight, the second day I took Nadia to the Giants Causeway, we strolled down and I asked her officially on the rocks with the ring and made it public to all my friends and family that we were engaged, so it truly was a special occasion”. Interested in Happy Valentine’s Day?